My Family Fun - Sleepytime Baby Snoopy Who doesn’t love Sleepytime his? Who doesn’t love Sleepytime his? 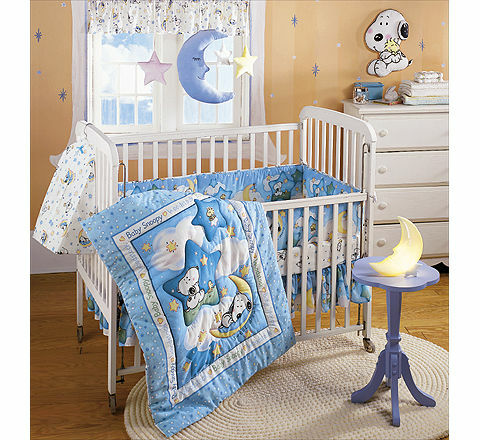 This toddler bedding set features the always popular Snoopy! He is so Baby Snoopy beautiful! 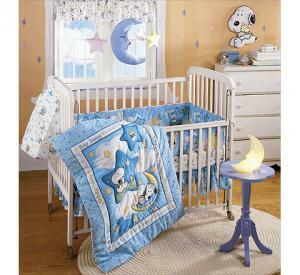 3-piece crib set includes quilt, bumper and sheet. All pieces are cotton/polyester and machine washable. Valance measures 88"W x 11"L and has a 3" rod pocket. Moonlite nightlight lamp casts a reassuring light in baby’s room. Sculpted of durable poly resin. Convenient on/off switch; uses 7-watt bulb (included). UL listed. 9-1/2"W x 10-1/2"L. Pastel velour moon and stars ceiling sculpture can be hung from ceiling or wall. Measures approximately 7"H. Wall hanging measures 12"W x 17"L. Made in USA, except lamp, imported.